“BE VIGILANT ABOUT WATER SAFETY"
Many of my columns feature PFD’s, (personal flotation devices/life jackets). Because of constant advances in PFD manufacturing, I believe the topic needs to be updated frequently. Releasing a new PFD to the market place is a lengthy task that consists of testing each of its materials. The completed product is then submitted to and tested by UL (Underwriters Laboratories). Printing or tagging must be approved and only then is a Coast Guard number of approval assigned. After all these steps are completed, which can take years, the product may be introduced to the public. I am very familiar with the rigorous testing. Several years ago I conducted an independent test of inflatable style PFD’s and worked with U.L. to resolve a defect discovered. If you make certain to purchase a lifejacket with a Coast Guard approval number imprinted on it, you should have a product that will last a good length of time if properly maintained. Maintenance varies with all types of PFD’s. Kapok style jackets can be washed with mild soapy water. After washing, or after a day of boating and getting sea spray on them, lay them out in the sun to thoroughly dry. If they are not totally dry before placing them in a closed container, they will mildew. When cleaning do not use bleach or mildew remover with any type of chlorine content. Chlorine must be avoided because it will weaken the material and threads and render the jacket unsafe. Try lemon juice on mildew spots, scrub lightly and set the jacket in bright sunlight to dry. If this doesn’t remove the stain, it should at least kill the bacteria and mold and reduce the chance of the mildew spreading. If your PFD’s have metal or plastic zippers or snaps, spray them periodically with silicone to prevent the fasteners from sticking. Most inflatable lifejackets come with specific instructions for use and care. Some recommend returning them to the manufacturer for service. To use these extremely reliable, yet comfortable PFD’s, you will be required to follow specific steps for maintenance to insure your safety. My objective for this article is not only to remind readers to check and maintain their PFD’s but also make you aware of a new problem concerning them. One summer day a grandfather brought a youngster aboard my charter boat for a fishing trip. I informed him it was the law that his grandson wear a PFD while aboard due to his age. When I questioned the child about the jacket he was wearing I was told, “This is my own lifejacket.” The grandparent had no idea the jacket was not intended to be worn as a PFD. The sewn-in label was difficult to read but gave an appearance similar to a Coast Guard approval label. “Swim assistance” products were first introduced in the form of blow up arm supports that assisted in helping beginners learn to swim. Recently, these products have become available in the form of a jacket. In fact, they look like a lifejacket to me and I am very experienced, having used all types over the years. The swim assist products come with a tag or printing etched inside that reads, “Swimming aid vest, warning use only under competent supervision; not to be used in boating; do not remove foam blocks; ensure zipper is securely fastened before and during use; conforms to as 1900:1991.” The text is somewhat unclear but does warn that a child wearing the device should be watched closely. What I found as a concern about the swim assist product I examined was a company whose name is recognized with water sports produces it and their logo is printed in bold letters on it. Of greater concern is the device is easily mistaken for a lifejacket. 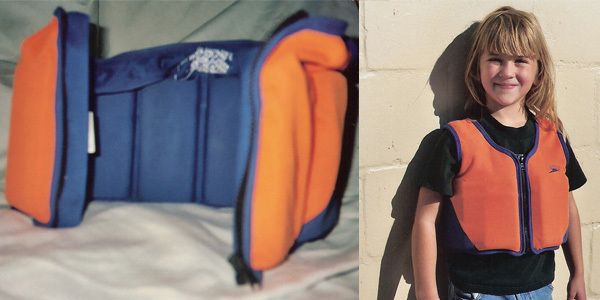 I have seen them in use and observed, as noted above, parents and grandparents do not realize they are not PFD’s. Safety on the water cannot be left to others. Each of us must be vigilant. Authors note: There are swimmers assist jackets that are Coast Guard “Approved.” When shopping for youngsters PFDs, look for a printed tag sewn inside that states, “Coast Guard Approval # - and the number will begin with 160. If you cannot find such a number do not use the jacket for a PFD. All Coast Guard approved PFD’s of any type and size must be sold with a special “Think Safe” pamphlet attached.